Attended Beeston Fields Grammar School, Nottingham, England. Career: Opened first menswear shop, Nottingham, 1970; opened in London, 1979; opened New York store, 1987; opened flagship Tokyo shop, 1991; introduced womenswear collection, 1993; opened first women's boutique, Paris, 1994; opened first children's shop, London, 1994; first Jeans shop, London, 1994; introduced watch collection, 1994; offered custom tailoring, 1998; new London flagship, 1998; 13 worldwide stores, sold in more than 40 countries, by 2001. Exhibitions: Observation, Victoria & Albert Museum, London, June-November 1995; Paul Smith True Brit exhibition, Design Museum, London, October 1995-April 1996. Awards: British Design for Industry award, 1991; named Honorary Fellow, Chartered Society of Designers, 1991; named Commander of the British Empire, for services to fashion industry, January 1994; Queens award for Industry, for export achievement, April 1995; invited to join the Labour government's Department of Culture, Media and Sport Creative Industries Taskforce, 1997; knighted for services to the British fashion industry, November 2000. Address: Riverside Building, Riverside Way, Nottingham NG2 1DP, England. Website: www.paulsmith.co.uk . Jones, Dylan, Paul Smith True Brit, Italy, 1995. York, Peter, "The Meaning of Clothes," in Blueprint (London), October 1983. Paul Smith, fall/winter 2001 collection. "Cue: Paul Smith," in Vogue (London), 15 September 1985. Boehlert, Bart, "Mr. Smith Comes to New York," in New York, 20 April 1987. Rumbold, Judy, "The Man of Paul Smith's Dreams," in The Guardian (London), 9 November 1987. Magazine (London), 29 November 1987. Schneider-Levy, Barbara, "Paul Smith, Anti-Fashionist," in Foot-wear News (London), 14 December 1987. "After Nottingham, the World for Smith," in Blueprint (London), December 1987. "Wearing Mr. Smith," in the Economist (London), 9 January 1988. Jeal, Nicola, "Smith Said 'Cotton'," in the Observer (London), 21 February 1988. Hamilton, William L., "The Schoolboy's Revenge," in Metropolitan Home, August 1988. Emmrich, Stuart, "The Hip Little Shop Around the Corner," in Manhattan, Inc., February 1990. Harris, Martyn, "The Designer Guru Who Suits Himself," in the Sunday Telegraph (London), 11 March 1990. Gandee, Charles, "Mr. Smith Goes to Italy," in House & Garden (London), April 1990. Fairchild, Gillian, "A Day in the Life of Paul Smith," in the New York Times Magazine, 9 June 1990. Jordan, Mary Beth, "I Am a Camera: Designer Paul Smith Shoots his New York," in Metropolitan Home, August 1990. Omelianuk, Scott, "Mr. Smith Goes Global," in GQ, August 1993. Morais, Richard C., "We're Finally Ready…," in Forbes, 24 April 1995. Spindler, Amy M., "Slim, Sophisticated Men's Wear in Paris," in the New York Times, 9 July 1996. ——, "In Paris, Men's Wear Sizzles," in the New York Times, 28 January 1997. ——, "Strength in Diversity at Men's Shows," in the New York Times, 9 July 1997. Fallon, James, "London's Hip Notting Hill Neighborhood is Now Home to Paul Smith," in DNR, 15 June 1998. Mower, Sarah, "Smith's Open House," in Harper's Bazaar, August 1998. Goldstein, Lauren, "Paul Smith Brings Designer Credentials to Custom Tailoring," in Fortune, 26 October 1998. Friedman, Vanessa, "Paul Smith Steps Out," in Travel & Leisure, September 1999. "Queen Knights Paul Smith," in WWD, 19 June 2000. Hiscock, Jennifer, "Different Cloth," in Marketing, 1 February 2001. Freed Carlson, Janet, "The Day-Tripper," in Town & Country, May>2001. "Sir Paul Smith," in Financial Times, 9 October 2001. The much-used phrase "classics with a twist" was the original design philosophy behind Paul Smith's menswear collections, where the element of classicism did not frighten traditionally conservative British male dressers. With no formal training in fashion design, Smith's fashion career began with his shop in Nottingham in 1970. The shop sold mostly other designers such as Kenzo and Margaret Howell, but it also stocked some early Paul Smith shirts, trousers, and jackets that he made in nearby workrooms. With the encouragement of Pauline Denyer, an RCA graduate in fashion, then his girlfriend, and evening classes at the local polytechnic, Smith was able to create more of what he wanted for his shops. His first collection was introduced in Paris in 1976; unable to find the type of clothes he wanted, he introduced his own designs for shirts and jackets, which he had made up in local workrooms. The evolution of the Paul Smith label away from classicism, which began in the early 1980s, was prompted by the proliferation of copyists springing up on the heels of his initial success. 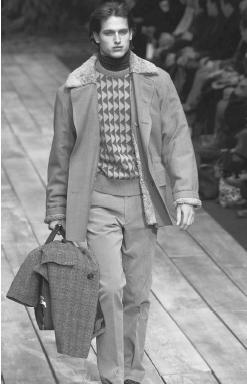 The Paul Smith style was imitated both in England and abroad by companies such as Next, Façonnable, and Henry Cotton's. Smith admits his decision to become a more fashion-oriented label resulted in confusion about the company's image. Although the classic phase of the label gave way to a higher fashion emphasis, the designer says he is often likened to America's Ralph Lauren because of his earlier image. Later designs are best characterized by wit and humor, with offbeat fabrics and colors creating a hint of excitement in the essentially practical styles. Smith's attention to detail is easily seen in the functional buttons in his men's suits and the inside pockets, hand-stitching, and vivid lining found in the women's suits. Smith continues to be the chairman of his company as well as the designer of the clothes. "At the moment, while I still have my health and my sanity, there is somebody called Paul Smith behind the label. And I am really behind the label. I am involved in every shop decision, every design decision, the way the advertising looks, the way the window dressing looks, the way the clothes look," Smith stated during an interview with Jennifer Hiscock of Marketing (1 Feburary 2001). Fiercely committed to his customers, Smith continues to work in his Nottingham Hill Gate Shop on Saturday afternoons when he is in London. It is his attempt to stay in contact with his customers and understand what they want. "I think a lot of designers or company bosses lose touch with the reality of their customers, or where they earn their wages. They surround themselves with subservients, have ivory-tower offices and chauffeur-driven cars, and eventually they just lose touch, especially in a fickle industry like fashion." Smith attributes his personal success to the fact that his early designs were representative of the company's classical phase. His jackets were traditionally styled, but he lowered the armholes to make them easier to wear and subtly changed the shape of the trousers. 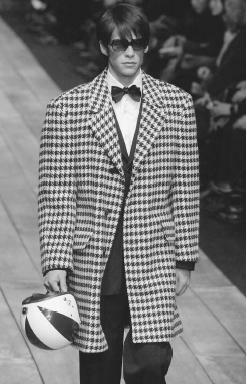 Using wools, tweeds, and fine cottons, Smith's designs retained just the right element of English tailoring traditions with a hint of eccentricity that appealed not only to conservative city types but also to the newly-emerged yuppie of the 1980s, for whom a Paul Smith suit became an important status symbol. By gradually introducing changes to the male wardrobe, Smith says he found his customers slowly became less nervous about adding a patterned tie or a colored sweater. Richly patterned or embroidered waistcoats, colored braces, and decorative socks are also examples of Smith's subtle changes to basic menswear items. Smith's own shops are an integral part of his design strategy and form the backdrop for his fashion designs. His was one of the first fashion shops to sell items other than clothes; they included watches and pens, modern sculpture, candlesticks, mirrors, and glassware. The selling of a lifestyle was also greatly imitated during the 1980s, when ordinary everyday objects achieved cult status in the right environment. Smith was responsible for the revival of the Filofax and men's boxer shorts during this period. A strong British pride has fueled Smith's work to establish design as a vital component in British industry. Recognition for his work in this area has won him numerous awards, placed him on the government's official list of ambassadors, and brought suitors like luxury conglomerates LVMH and Gucci Group to his door. He has refused all offers of consolidation, content to maintain his firm and its independence. Paul Smith, paragon of style, was rewarded for his unique brand of service to his country and the British fashion industry when he received the coveted title of "Sir,"and earned a knighthood from HRH Queen Elizabeth II in November 2000.